Philip Drury Dawson (born January 23, 1975) is an American football placekicker for the San Francisco 49ers in the National Football League (NFL). He played for the Cleveland Browns from 1999 to 2012 and holds their franchise record for most field goals made, passing Hall of Famer Lou Groza in 2010. He played college football at Texas. Dawson attended Lake Highlands High School in Dallas, Texas and was a letterman in football. In a 1992 playoff game at Texas Stadium against Nacogdoches High School, Dawson kicked a 52-yard field goal as time expired to beat Nacogdoches 31-28. He graduated in the class of 1993; the Modell Era Cleveland Browns placekicker Matt Stover attended the same high school, graduating in 1986. As a senior, he was a starter at both kicker and offensive tackle until he hurt his knee in a preseason scrimmage. He thought he might have to have season ending surgery, but he gutted it out, stuck to kicking, and was named as an All-American and the Southwest Region Offensive Player of the Year by SuperPrep. Dawson attended the University of Texas at Austin, where he was a four-year letterman in football. After redshirting his freshman year, he scored 80 points his first year of playing. He also tied a school record with 54 consecutive extra points. The following season he made honorary All-America honors while leading the Longhorns in scoring. He made first-team All-America his junior and senior years, while simultaneously making All-Big 12. He earned a B.A. in political science. Dawson is famous for his 1995 game-winning field goal against University of Virginia, booting a 50-yarder against a 30-MPH wind to give Texas a dramatic 17-16 victory as time expired. Dawson was signed as an undrafted free agent by the Oakland Raiders, who then waived him. He was picked up by the New England Patriots and assigned to the practice squad, but never appeared in a game for them. The Cleveland Browns signed him as a free agent in March 1999, and he remained with the team before he was signed by the San Francisco 49ers on March 19, 2013. (He was the only player left from the 1999 Browns squad). Dawson holds the Browns record for most consecutive field goals made (29) and most field goals in a game (6). Dawson is currently the 7th most accurate kicker in the NFL. On October 10, 2010, Dawson tied Lou Groza for the Browns' career field-goal record with 234. The two are tied for 35th in NFL history. Dawson scored the first points in the history of the "new" Cleveland Browns in 1999. On October 10 of that year, he scored the only touchdown of his career on a fake field goal against the Bengals in an 18-17 loss. His official career long was a 56-yard field goal on November 17, 2008, which would prove to be the game-winner against the Buffalo Bills on Monday Night Football. However, he did hit a 59-yard field goal in an August 14, 2010 preseason game. Dawson would have become an unrestricted free agent at the end of the 2010 season, but he was given the franchise tag on February 22, keeping him for the 2011 season. Phil Dawson in his 49ers uniform. Dawson signed with the San Francisco 49ers on March 19, 2013. Phil Dawson made a career franchise 27 consecutive made field goals throughout the 2013 season until being snapped by a 24-yard field goal miss against the Arizona Cardinals in week 17, 2013. He finished his first year in San Francisco with the second most points (140) and field goals (32-of-36) in the team's history. Dawson kicked the game-winning field in the 49ers Wild Card playoff game versus the Green Bay Packers on January 5, 2014, giving the 49ers a 23-20 victory. On 26 September 2013, Dawson attempted and missed a 71-yard fair catch kick in the dying seconds of the second quarter of a game against the St. Louis Rams. He is the last recorded player to have attempted this unusual play. On March 11, 2014, Dawson signed a new two-year contract to remain with the 49ers. Uncle Phil made his 400th field goal on November 20th against the Patriots. Dawson had a rule named after him after a missed call by referees. On November 18, 2007, Dawson attempted a 51-yard field goal in the closing seconds of the fourth quarter to tie the game against the Baltimore Ravens. The kick carried through the air and hit the left upright and then the rear curved post (stanchion), which bounced the football over the crossbar and into the end zone, in front of the goalpost. The kick was originally ruled no good. Under NFL rules, the play was not reviewable. Officials discussed the play among themselves for several minutes and decided that, since the ball had indeed crossed the crossbar within the goal, whatever happened afterward to the ball did not matter. The kick was considered good, as announced by referee Pete Morelli. However, as the play is not technically reviewable, referee Pete Morelli announced that the play was reversed "after discussion," as opposed to "after further review," as is usually stated. At this point the Ravens, already celebrating in the locker room (they would have won 30-27 if the field goal was no good), were called back out onto the field to proceed to an overtime period. The Browns went on to win the game, 33-30 in overtime, as Dawson came through again with a more visible 33-yard field goal. Phil Dawson finished 4 for 5 in FGs whereas fellow Lake Highlands High School alumnus Matt Stover finished 3 for 3 in FGs for the Baltimore Ravens. Prior to the 2008 season, the rule was changed to allow field goal and extra point attempts that hit the uprights or crossbar to be reviewed. This new rule is dubbed the "Phil Dawson Rule". Dawson resides in Austin, Texas with his wife, Shannon, and three kids, Dru, Beau, and Sophiann. Dawson kicks right-footed but throws left-handed. ↑ "Box Score". ESPN.com. September 26, 2013. Retrieved September 26, 2013. ↑ "49ers pull in front of Rams 14-3 at the half". Belleville News-Democrat. September 26, 2013. Retrieved September 26, 2013. ↑ Inman, Cam. "49ers kicker Phil Dawson re-signs". mercurynews.com. Retrieved 11 March 2014. ↑ Sessler, Marc (March 12, 2016). "49ers re-sign kicker Phil Dawson to one-year deal". NFL.com. Retrieved March 12, 2016. ↑ "Proposal to reseed playoff teams withdrawn by owners". 2008-04-02. Retrieved 2008-04-02. 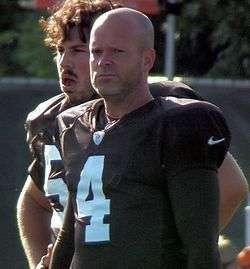 Wikimedia Commons has media related to Phil Dawson.